Just Write About It. : My piercing HELL! Stage 1: Looking all pretty and nice. They looked nice didn't they? How wrong I could have been. 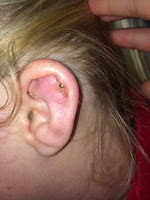 This is my ear cartilage piercings nightmare, caution, this does include vile pictures. 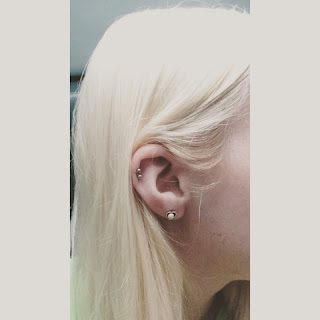 On our last trip to the mall as a group, I decided to get my ear pierced how I've wanted it for years, and so when I saw Claires, a big name and therefore a trusting brand, in Westfarm Mall, myself and two others jumped at the opportunity to have our piercings. U.S. Law means that you can pierce the ear cartilage with a gun, something which the UK no longer allow. And so of course, I had two piercings at $20 odd dollars. It was fine for around a week, and then the problems started to occur. It started filling with puss and making my ear sensitive to touch. It would swell up then just cry out with discharge. I got the ear back to normal with a salt water soaked cotton ball and taped it to my ear over night and sleeping on that side with a travel pillow so there was nothing directly touching the ear but still it would allow it to drain. Everything then appeared as though it was fine again as my ear started to take shape. But the ultimate was to happen. After my flight back to the UK I noticed it was hurting more again. 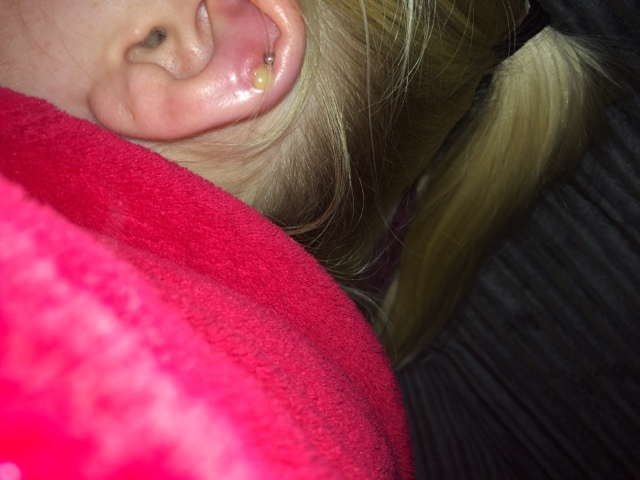 I fell asleep on the sofa for an hour on the opposite side meaning that the ear would swell up. Stage 2: Waking up to this monstrosity. When I woke it was FILLED with yellow puss surrounding the actual lower piercing completely. Thinking it just needed cleaning and draining again, I rushed to the bathroom to disinfect it yet the issue was much worse. My ear had actually swallowed the piercing up. My skin had completely grown over the front of the earring so that you couldn't even see that it was there. My mum tried to push it back through but it just started to bleed and made me instantly feel sick and as though I was about to pass out. Because it was a Saturday night and quite late already, going to A&E would have been a nightmare and so we taped it up again over night and let it drain again before calling up the out of hours nurse who advised we go straight to the infirmary. Stage 3: The second piecing is completely embedded. After checking in at the desk, we waited for around 40 mins before being seen, record time for a UK hospital. 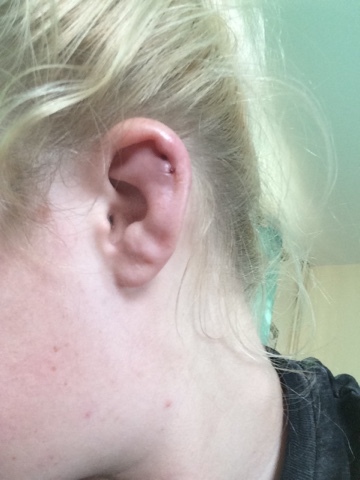 There was both a surgeon and a doctor present who said that the only thing they could try to do would be to pull both piercings out of the back of my ear. To do so they said they'd have to inject it with local anaesthetic, which could be prevented from working due to the large amount of puss surrounding the infection on my ear. 4 injections later, which hurt, ALOT, the first earring was pulled out through the back of my ear. I screamed, I cried and I nearly pulled the doctors hand off. But it wasn't over yet. Next was the top piercing which they would use the same method for. It hurt just as much. The anaesthetic did nothing due to the infection and so I had no option than to grit my teeth and squeeze the doctors and my mums hand as tightly as I am capable. Stage 4: after the earrings had been ripped out of the back. The surgeon then had to squeeze as much of the infection out as possible. It was horrendous. I was in excruciating pain that I have never ever experienced pain like it, mum said that's because I haven't given birth or had a tattoo... But it was up there! U.S. Law means that ear cartilage piercings can be administered with a piercing gun, even in an establishment like Claire's. But I would strongly advise that if you are to get it done, see a tattoo and piercing parlour where they will properly sanitise it and use a needle instead. It is not worth the pain and the state that my ear is now in, trust me. I have to have 4 antibiotics a day now and painkillers until the infection has gone. Happy days! Feels good to be home!